Swimming star Brooke Hanson, OAM, an Olympic gold and silver medallist, remains one of Australia’s most recognised Olympians. Brooke made her debut for the Australian Swimming Team at the 1994 Commonwealth Games before going on to represent Australia over 25 times at major international championships. In 2004 Brooke climbed her Everest, when, after missing two Olympic teams in 1996 and 2000, she won her Olympic gold and silver medals in Athens. Brooke’s was one of the real success stories of 2004, hearing her name read out on the Olympic team after winning three gold and one silver medal in front of a packed hometown crowd at the Olympic Trials in her hometown, Sydney. And she has not looked back since. After winning silver in the 100m breaststroke and gold as a member of the 4x100m medley relay team, Brooke went from strength to strength. She created history at the 2004 FINA World Short Course Championships in Indianapolis where she won a record six gold medals – five individual and the 4x100m medley relay in world record time. After 13 years as a member of the Australian swimming team Brooke joined the motivational speaking circuit and her’s is a story to behold – giving a behind the scenes insight of a young woman’s journey to reach her Olympic dream. Since her retirement from competitive swimming Brooke released her autobiography “When Silver Is Gold” The Brooke Hanson Story and she loves nothing more than to share her inspirational story with everyone she meets. Her television presenting on the TV Week Logie winning show “What’s Good for You” earned her a Logie nomination for Best New Female Talent. Brooke is currently the female presenter on the Nine Network’s Discover Downunder and along with fellow presenter Tim Smith enjoys exploring the best camping and caravanning holiday destinations around Australia. 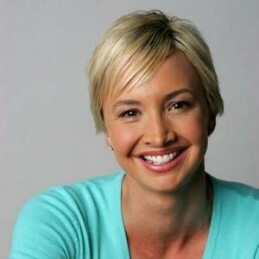 Brooke has gone on to enjoy a successful career for herself as a television host and product ambassador and continues to balance her blooming professional media career with, motherhood, sponsorship appearances, motivational speaking, charity events, swim clinics and her commitment to promoting a healthy and active lifestyle for all Australians.